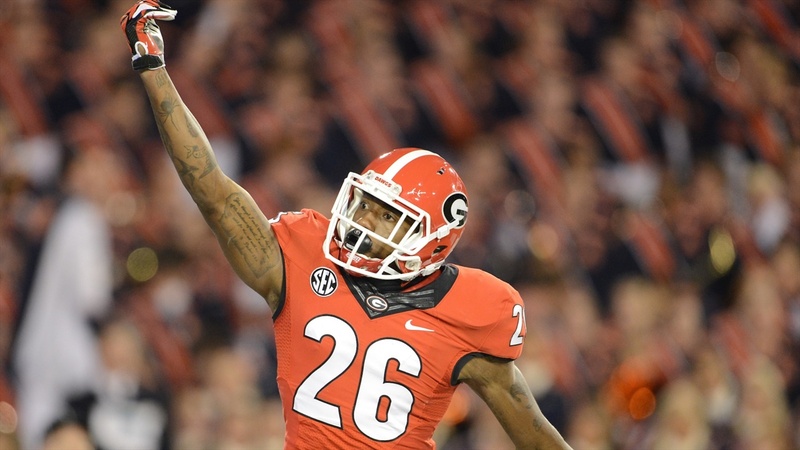 Malcolm Mitchell stood up and slapped his hands together – rubbing them as he smiled. Meanwhile Mike Bobo and John Lilly were stationed outside – nervously waiting to see what was about to happen. Georgia fans across the state were listening to an AM radio station steaming Mitchell's decision over the Internet. The feed from the station was fading in and out due to the amount of online traffic. One way or another Mitchell was about to provide or take away momentum for the Bulldogs at one of the most pivotal moments in recent Georgia history. If Mitchell picked the Bulldogs, Mark Richt and his staff of coaches would have momentum going into the final stages of recruiting. If Mitchell picked Alabama, the Bulldogs and their fans would again ask what went wrong – wondering just how far the ship could sink. It was the pivotal moment in a month full of pivotal moments. Mitchell's announcement was quintessential recruiting – fast and furious – the silly season of speculation was in full view for the world to see. But unlike so many other times in the recruiting game, no one knew what was about to happen. January 20, 2011 was the public start to the turnaround of Georgia's program, but the 21 days before that were painful for the Georgia faithful. The winter was particularly cold after Georgia's 6-7 performance in 2010 – a loss to Central Florida made things worse. Fans were looking for signs that the program was getting back on the right track – the weeks of early January didn't give them much hope. Mark Richt was a busy person in January 2011. He started the New Year off on a plane back to Atlanta from Memphis after a disappointing loss to Central Florida. From that moment he spent the 22 of the next 31 days on the road. He visited no fewer than six states during the month – going from Connecticut to Texas one day and Nashville to Asheville another day. so the winter of 2011 was a critical one for the program. The Bulldogs were coming off of their worst season in 14 years – the only losing season of the Richt era. The pressure was on for Georgia to win in a big way in 2011, and in order to do that they needed to close strong on their 2011 recruiting class – the so-called "Dream Team" – a term used by Richt and company as a recruiting tool to describe the abnormally talented 2011 class of prospects in the state of Georgia. Three weeks into January Georgia's hopes of closing strong had not yet happened… and that happening was not guaranteed. During the madness that is the lead up to Signing Day it's easy to forget that the outcome of the critical moments of January and early February are days, months and even years in the making. It's also easy to forget that relationships, which are built up over the years, can be second-guessed and affected by almost anything that pops up in the winter air. Huge decisions for prospects are made even more complicated with every variable added to the mix. The events of January 20th – which saw two high-level prospects commit to the Bulldogs and an assistant coach leave to take another job – were in the making long before that day. The events of that day had a profound effect on the trajectory of the Bulldogs' program. By the time Malcolm Mitchell took to the airwaves that Thursday night it was nearly 7 p.m. Georgia head coach Mark Richt had been up since 6:31 a.m. His travel companion from the day before and offensive coordinator for the previous five years, Mike Bobo, spent the night in Valdosta and only got six hours of sleep. He was probably tossing and turning all night because he knew the importance of signing Mitchell was not limited to him simply playing for Georgia – it was also about keeping the explosive playmaker from choosing Alabama. John Lilly joined Bobo in Valdosta by the time Mitchell took to the airwaves. Mitchell's commitment signified a slew of things for the Bulldogs. In a way, recruiting is a proxy war at every turn. Teams don't actually play on the field, but emotions from the just-concluded season run deep each winter in the South. Boosters are accused of cheating, bagmen (the person responsible for distributing illegal payments to prospects or their surrogates) are whispered about… it is the silly season in the world of college football. And for Georgia, Mitchell's commitment date was the Dawgs' last best hope of winning a critical in-state commitment – a final chance to swing momentum their way in the fickle, but critical world of college football recruiting. Earlier in the month two top Peach State prospects – Xzavier Dickson and Quan Bray – picked Alabama and Auburn on national TV. Insiders saw it coming, but fans didn't – and they were taking out their frustrations on Richt and company publically on Internet message boards and social networks. Anything that could go wrong for the Bulldogs was going that way. The loss of Bray and Dickson on national TV pushed the Dawgs in the corner even more. Everything was piling up – the loss to lowly Central Florida started the ball rolling against the Dawgs heading into January. Bray's and Dickson's commits elsewhere made things feel even worse – Mitchell's commitment was critically important to the Bulldog program if for no other reason than the way it would look if he signed with Alabama. Looking back, January 5th 2011 was the low point for the program at Georgia. It was less than a week from one of the worst losses of the Mark Richt era and recruits Georgia needed badly – specifically Dickson – were turning their backs on their in-state school. As it turned out the depths of the lows wouldn't outpace the height of the highs that recruiting cycle, but no one knew that on January 5th--and very few believed it would happen. It's easy, particularly after a losing season, for fans to predict that the world will end. Things were bad in Athens for sure, but across the South other teams were celebrating – and that made for an even more agitated bunch in red and black. Less than a week after Dickson and Bray committed to Bama and Auburn salt was poured into the Dawgs' wounds as a Georgia native, Cam Newton, led Auburn to the BCS national title; but Richt must have been feeling somewhat OK about the future as one of Georgia's main rivals won the national title. No, he wasn't pulling for the Tigers. Instead, he took a phone call from Ray Drew at 11:20 p.m. that Monday night – just as the Tigers were kicking the game-winning field goal. The two talked for 26 minutes before getting off the phone just before midnight. Drew, a prospect who lived only miles from Florida State, was uncommitted and was viewed as one of the players the Bulldogs could not let skip away in January. As Richt's conversation with Drew proved, the Bulldogs had a few rabbits in their hats at that time… a slew of high-level recruits were still out there to be had, and Georgia had to have some of them to win in 2011, and everyone knew it. The first ten days of the New Year were not good – but the following three weeks likely would determine the fate of Richt and his coaches. It was still possible for Georgia to get up off the mat even as the confetti fell on the Tigers in Arizona. Still on the table in January were: Malcolm Mitchell, Jay Rome, Ray Drew, John Jenkins, Jeoffrey Pagan, Antonio Richardson and, most importantly, Isaiah Crowell. Bobo and Richt both knew that they would have to gain a healthy percentage of that group. Crowell was the most important of the bunch, but would he come to Georgia if they didn't have recruiting momentum? Would he come to Georgia at all? Crowell, like everyone else Georgia was recruiting, had options – seemingly endless options. Alabama was the main opponent in the fight for both Crowell and Mitchell. The Tide, who had won the national title two seasons before, was the source of much angst in the Bulldog Nation when it came to recruiting – probably because fans knew that losing Crowell and Mitchell would make for a very long 2011. That turned out to be true – Mitchell led the Bulldogs' wide receivers in receptions that fall; Crowell was named the SEC Freshman of the Year. Richt and Bobo probably knew that losing the duo to Bama would make for a very long 2011. Actually, they knew losing those two recruiting battles might cost them their jobs. In Valdosta on the night of Mitchell's announcement Bobo and Lilly wondered what was about to happen – they were genuinely in the dark. Mitchell's radio station was broadcasting remotely from a restaurant in Valdosta. Inside it was a packed house. Jay Rome, Mitchell's teammate had committed to the Bulldogs on TV earlier in the day, but he was unaware of what Mitchell would do. Fans at the event marveled at Rome's ability to put away the hibachi as it was served. They didn't know for sure if he could play football, but they knew he could eat. Like Rome, Bobo didn't know what Mitchell was going to do, either… in fact, almost no one knew. Bobo called Richt, who was in Tampa, during the radio show. The two talked for six minutes. Mitchell was a big deal – there was no question about that – but Mitchell's commitment announcement wasn't the only thing on Richt's mind. Three days before Mitchell's on-air announcement Richt boarded a plane with his offensive line coach Stacy Searels. The two headed to northwest Georgia and then on to Memphis on a recruiting trip. Just before wrapping up the day-long trip Searels called an Austin, Texas number at 7:21 p.m. Richt, who was also in Memphis at that time, made a final phone call just before boarding the plane at 7:17 p.m. Richt arrived back in Athens no later than 9:50 p.m.
Did Richt know that Texas and Searels were talking? That's unclear, but when he arrived back in Athens he received an important phone call. It's 10:26 p.m. on Monday night, January 17th, and Richt picked up the phone. "I can't even remember what I said," Mitchell said of calling Richt. The Valdosta native had just returned from Alabama, where he and Rome were on an official visit with the Tide. It was still three days before Mitchell's decision, but he clearly had Georgia on his mind. He told Scout.com's Chad Simmons that neither Alabama nor Georgia had the edge going into the Thursday announcement, but his phone call to Richt that night seemed to indicate that he felt strongly about the Bulldogs – but insiders say no one at Georgia was confident about Mitchell… Bama wasn't either… the recruiting world, for once, was totally clueless. The telephone conversation between Richt and Mitchell was the longest one Richt had all month. Richt knew signing Mitchell was important, but Searels' job was a critical one, too. At a minimum Richt was juggling multiple tasks in the air at the same time. It is a good example of a day that has happened every year of Richt's tenure – he's lost at least one assistant coach every year of his tenure. The trip to Memphis was a long one, but the length of the trip was not out of the ordinary for Richt during the month. However, the circumstances surrounding it were. Richt was in the process of losing a key assistant coach – while he was physically with that assistant coach no less – and he was trying to pull in one of the most important prospects on his recruiting list moments after he'd returned from the rival school's campus. In a way, Monday January 17th is everything the last month of recruiting is known for – unpredictable and rapid fire. The media and fans are almost always in the dark as it relates to the entire truth – but coaches are often in for surprises, too. For his part, Searles stayed in west Tennessee as Richt returned home. Searles communicated with the same Texas phone number several times over the next couple of days as he hammered out a deal to leave Georgia and head to the University of Texas. The same day of Mitchell's announcement, Searles is announced as the Longhorns' new offensive line. The rest of the coaching staff had to figure out how to recruit the critical recruits remaining. Defensive coordinator Todd Grantham had two key recruits he needed to reel in during the 2011 recruiting class, and publically neither was a shoo-in to go to Georgia. Privately, however, both John Jenkins and Ray Drew seemed headed to Athens. Grantham knew he needed a nose guard for his 3-4 scheme, and Jenkins was perfect for it. Eight years later Georgia's Dream Team Class of 2011, has, in many was followed the pattern of many other recruiting classes gone before them. There have been surprises – both good and bad. In the end, however, the Dream Team did what it needed to do. With the additions of the class of 2011 the Bulldogs won the SEC East two years in a row. In Between – Guided Georgia to a 30-11 record since signing the Dream Team. Georgia twice won the SEC East Championship and finished ranked #5 in the final 2012 poll after narrowly losing the SEC Championship Game to Alabama. After three more seasons in Athens, he was fired at the end of the 2015 regular season. Miami, where he played college ball, hired him days later. He led the Hurricanes to nine wins, and the program's first bowl game in a decade. But after an Orange Bowl appearance in 2017, Richt retired from Miami after a turbulent 2018 days after Christmas. In Between – Drew struggled to find his footing before turning on his performance in 2013. Drew played in only 20 games his first two seasons at Georgia. He played in 13 games in 2013 with seven starts. Drew had only 31 tackles his first two seasons – he had 24 in 2013. He finished his career after the 2014 season and 2015 in four different NFL locations before playing in the CFL in 2016 and 2017. In Between – Crowell was the jewel of the Dawgs' class and was the team's leading rusher in 2011. But his accomplishments in one season at Georgia were outweighed by his dismissal by Richt after being arrested on weapons charges that were eventually dismissed. Crowell transferred to Alabama State and played immediately. He declared for the NFL Draft after his junior season and signed a free agent contract with the Browns. After his fourth season with the Browns, Crowell signed a three-year, $12,000,000 contract with the Jets. In five seasons in the NFL, Crowell has run for 3,803 yards and 27 TDs. In Between – Mitchell became a critical cog in the Bulldogs' offensive arsenal during the two years he played. He was the second leading receiver in both 2011 and 2012. He suffered a season-ending ACL injury on the first offensive drive of the season at Clemson in 2013. He returned to complete his career at UGA in 2015 after missing much of the 2014 season. Mitchell went on to win Super Bowl LI with New England in his only season of NFL play. Drew, who picked the Bulldogs on January 28th, was pivotal in recruiting fellow Dream Teamers to Athens. Records show that Drew called Georgia coaches a lot. It was not abnormal for his conversations with Grantham to last longer than 15 minutes. Drew called Grantham five times, Richt 15 times and Bobo 12 times in January alone – in other words he checked in about once a day. Ray Drew, who may have been confusing fans with his Facebook posts claiming: "WAR EAGLE!" wasn't fooling anyone on Georgia's coaching staff. He was headed to Georgia – and they knew it. Records indicate that Ray Drew was on the line with a coach at Georgia just before, during or after important and pivotal times in January. Auburn wins the national title? Drew is on the phone with Richt. Malcolm Mitchell holds a press conference? Drew is on the phone with Richt at 7:44 p.m. The day Xzavier Ward commits to Georgia? Richt and Drew talk twice. The day Drew commits to Georgia? He and Richt talk three times, and he speaks with Bobo the night before. Signing Day? Mike Bobo's second phone conversation of the day, at 7:17 a.m. in the morning, is Drew. The day John Jenkins holds a press conference? Richt and Drew speak moments before Jenkins takes the podium. Drew was a critical tool for the Dawgs. "I didn't know anyone who Georgia was recruiting besides Ray Drew," Jenkins admitted. Without Drew they might not have been able to pull together the class they had – they certainly would not have had a particular amount of intelligence he brought about recruits. Jenkins and Richt, too, seemed to have a strong relationship. Those two talked on the phone 17 times in between New Year's Day and the day Jenkins signed with the Bulldogs on February 5th. Grantham and Jenkins talked 15 times during that period. Records show that Richt was in Connecticut on January 6th from at least 8:46 a.m. until 5:39 p.m. He left to go to Dallas the next day. For two years – maybe longer – people in and around the South knew that Carver High School's Isaiah Crowell was a special, game-changing player. Georgia sure knew about it. Records show that the Bulldogs spent a substantial amount of time and money recruiting Crowell. Georgia's recruiting reports show that expenses that included trips to Columbus (where Crowell lived) totaled $19,781 – in travel costs alone. Mark Richt and Bryan McClendon, along with Auburn coach Gene Chizik, decided to visit Crowell as early as they could in the fall 2010 recruiting process – on September 3rd at Crowell's second football game of the season. Crowell and company dismissed state power Buford 14-0 in Columbus. Crowell may have been playing his cards for the world to see when he hugged Richt after a long run in the second half of the game. Still, as the leaves turned in the fall Crowell seemed more likely to wind up at Alabama than he was Athens. He took in games at Alabama, Auburn and Georgia in the fall leading up to January. His official visit to Alabama came a week before he visited the Bulldogs officially. All the while McClendon, who was the lead recruiter of Crowell for the Bulldogs, was doing his best to recruit the star running back. McClendon was in Columbus all day on January 7th. He was back there all day on January 18th – the day before Crowell's close friend Quintavious Harrow committed to the Bulldogs. When Crowell visited the Dawgs officially in January McClendon's phone records are littered with calls from Columbus extensions. Five days later McClendon returned to Columbus a final time. He drove to Columbus the morning of January 27th and didn't return home until after midnight. Crowell was a priority for Georgia – that was clear to everyone in the recruiting world – and the records prove it. And while Georgia coaches might have felt good about their chances with Crowell, records show that they may have been a bit in the dark. Crowell only called McClendon and Richt a combined three times in January. Richt and Crowell spoke for 13 minutes on January 10th and seven minutes the Tuesday after he returned from his official visit, but telephone communication between Richt and Crowell was limited. Crowell was the anti-Ray Drew… no one knew what was really going on with him. The Bulldogs were doing their part to sway Crowell to Georgia. On January 23, the Sunday of Crowell's official visit to Georgia, Richt and company rolled out the "missing man" formation in the program's new indoor meeting space. Crowell sat in Richt's office overlooking ten offensive players. By the time Richt, Crowell and his family went to the floor level of the facility the players were in formation – but without a running back. Richt, who is not always known for being innovative in the recruiting game, did so this time with Crowell. Richt was given a "letter of admonishment" and restricted from calling high school prospects that April, but the dye may well have already been cast. The Bulldogs gathered around TV sets in their new offices and watched as Crowell pulled a Bulldogs puppy from out of nowhere and hosted the symbol of his new college in the air for the recruiting world to see. Mitchell reached down with his left hand to grab one of three hats on the table in front of him. "It's going to be…" the radio host yelled into the microphone. Mitchell grabbed the white hat on the table in front of him. Barking began – and madness ensued. Georgia's turnaround had just started for the public to see. Mitchell was surrounded by loved ones in the restaurant, but not by coaches. The recruiting world heard it over the radio – Mike Bobo and John Lilly listened to it outside the restaurant before rushing in to congratulate Mitchell on the decision. Richt called Bobo twice during the event before the prospect made his decision. The day was one of the busiest days of the month for Richt, who was in the midst of replacing an assistant coach and stressing over Mitchell's announcement. He made 93 calls that day. It was also one of the few days in the month he didn't start his day in Athens. Richt, as it turns out, got no more than six hours of sleep that night. "All I know is that recruiting is a battle," Richt said. "Recruiting is not always designed to be fun." But the next night must have been very good sleep for the Georgia head coach. Mitchell, as it turns out, got the Bulldogs over the recruiting hump. With the momentum from the Mitchell announcement Richt and company went on to get commitments from Xzavier Ward, Ray Drew, Kent Turene, Isaiah Crowell and John Jenkins. The Bulldogs' leading receiver, rusher and critically important nose guard all picked the Bulldogs on or after January 20th – the day of Mitchell's announcement. It was the moment everything changed for the Bulldogs. "I had no idea it happened that way," Mitchell said looking back on it.